351 UMaine students! 23 teams of dancers! 12 hours of dancing to the beat of miracles! It’s the University of Maine’s Black BearTHON. 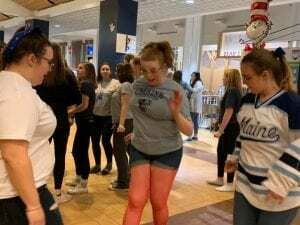 On Saturday, more than 350 students came together in the Union to raise money for Northern Light Eastern Maine Medical Center’s pediatrics and neonatal intensive care units. This was the university’s eighth dance marathon, and together, the students raised $37,496 to help make miracles happen for Maine kids! Thanks, dancers! We love our friends from UMaine! And, we’re especially thankful to our friends from Emera Maine, OHOP, and Sam’s Club, our sponsors for this great event!